VeroFlex™ and VeroFlexVivid™ are PolyJet rigid photopolymer materials offering a flexibility ideal for rapid prototyping eyewear. Get prototypes with full-part realism in a wide range of colors, textures and materials from opaque to transparent, unique to the Stratasys J735/J750. VeroFlex accurately simulates the look, feel and function of eyewear, enabling improved performance testing. 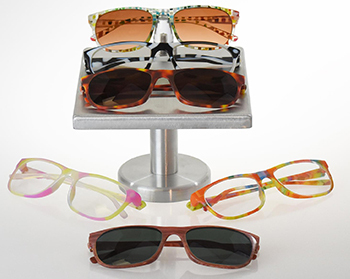 Eyewear prototypes produced with Veroflex can better withstand drop tests, lens-mounting and wearability tests. Shorten product development cycles down to one to two months with a more efficient design workflow. Respond to market trends faster and improve eyewear sales with VeroFlex on your Stratasys J735/J750. For brighter colors, try the VeroFlexVivid Colors – VeroFlexVivid-Magenta, VeroFlexVivid-Yellow, and VeroFlexVivid-Cyan. Digital ABS Plus (fabricated inside the 3D printer from RGD515 Plus* and RGD535 or RGD531) provides better impact strength in addition to its previously well-known attributes of high-temperature resistance, toughness and superior finish. Digital ABS2 Plus delivers those properties plus superior rigidity and toughness in walls thinner than 1.3 mm (.051 in.). 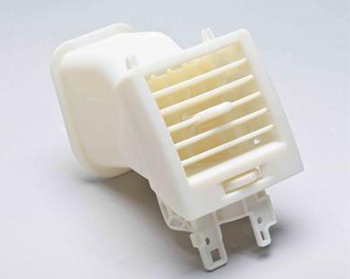 Both materials are suitable for parts that require PolyJet technology’s highest possible impact resistance and shock absorption. Available in Green and Ivory. High Temperature material (RGD525, white) combines heat resistance with exceptional dimensional stability. The material can simulate the thermal performance of engineering plastics and is ideal for testing applications such as hot-air flow or hot-water flow in pipes and faucets. Objet High Temperature material has a heat deflection temperature of 63–67 C (145-153 F) upon removal from the printer. Thermal post treatment in a programmable oven can increase this to 75-80 C (167-176 F).